Archives : MEDIUM TERM TREND TURNS BEARISH - 10/10/2014. MEDIUM TERM TREND TURNS BEARISH – 10/10/2014. It was a tough week for the market as the indices lost more than a percent for the week. On Friday, Infosys presented a solid set of results as it beat street estimates on all parameters. Infosys went up by around 8% after declaring not only strong result and guidance but it also sprung a positive surprise for its shareholders by announcing a liberal 1:1 bonus and an interim dividend of Rs.30. Despite such strong showing by Infy, global cues spoiled its party on D-Street as Sensex tanked by 330 points and Nifty lost more than 100 points for the day. Sensex opened the week at 26487, made a high of 26688, low of 26150 and closed the week at 26297. Thus it closed the week with a loss of 270 points. At the same time the Nifty opened the week at 7897, made a high of 7972, low of 7815 and closed the week at 7859. Thus the Nifty closed the week with a loss of 86 points. Both the indices have formed a black body Spinning Top on the weekly charts. Even the last week’s candlestick pattern was similar and hence next week’s candlestick pattern will be of great significance. A bearish formation next week will signal further downside in the near term. On the daily charts, Sensex has formed Opening White body Marubuzo on Thursday and an Opening Black body Marubuzo on Friday, suggesting the bullishness gained on Thursday has been washed out due to Friday’s candlestick formation and the market is now ready to move lower in the short term. 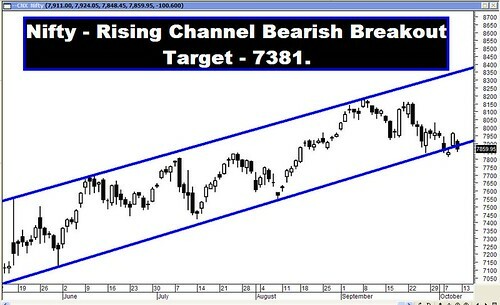 This week finally the Nifty managed to complete a bearish breakout to the Rising Channel formation formed over last five months. As per this breakout, Nifty is now headed lower towards a potential target of 7381. Even though the Sensex has just managed to hold on to the breakout, it will be just a matter of time when it realigns its movement with that of the Nifty. In the near term, the markets are correcting the upward rally from an immediate low of Sensex 25232 and Nifty 7540 to a high of Sensex 27354 and Nifty 8180 and the relevant Correction levels are at Sensex 26544-26293-26043 and Nifty 7935-7860-7784. For the first time in many months, both the indices have managed to close the week below the medium term average of 50dma (Sensex – 26465 and Nifty – 7913) besides continuing to remain lower than the short term average of 20dma (Sensex – 26716 and Nifty – 7995). However, both the indices continue to remain well above the long term average of 200dma (Sensex – 23694 and Nifty – 7071). Thus the trend in the short and medium term is bearish while that in the long term remains bullish. MACD and ROC both are negative and continue with their Sell signals. RSI (43) continues to remain below the equilibrium line, suggesting bearish momentum. MFI continues to remain below the centerline and is at 38, suggesting money flowing out. ADX has reduced further to 21, suggesting a further decrease in the strength of uptrend. Directional Indicators continue in Sell mode as +DI remains below –DI. OBV is in Sell mode and is making lower top lower bottom formation. Bollinger band continues with its Sell signal given two weeks back. Thus Oscillators are suggesting a bearish bias in the short term. Option data suggests that highest Put Open Interest build-up is at the strike of 7800 and highest Call build-up is seen at the strike of 8200. Thus Option data suggests short term trading range with support coming in at 7800 and resistance around 8200. 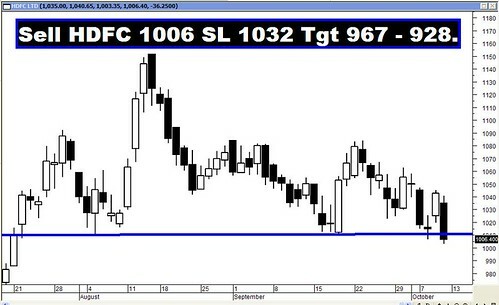 On Friday, 7900 Call has seen strong Open Interest buildup which suggests immediate resistance at the level of 7900. 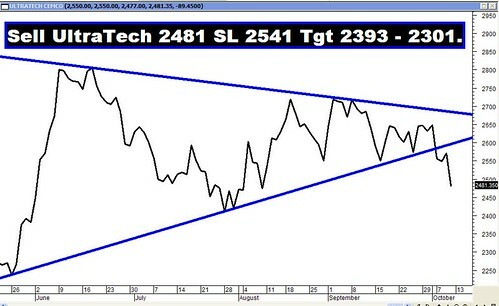 Strong Trendline Support for the Sensex is at 26023. Trendline Resistance for the Sensex is at 27158. Strong Trendline Support for the Nifty is at 7814. Trendline Resistance for the Nifty remains at 8132.